You may or may not be aware that in the UK, the PAL TV standard is used. In countries such as the US, Canada, Japan, France, Brazil and many other countries the NTSC TV standard is used. If you have a tape that has been recorded using NTSC Standards and you need to play it on a UK television system, it will need converting to PAL. Conversely, PAL recorded tapes will need to be converted to NTSC in order to play on TV systems in the US, Japan and Canada. We can convert any PAL recorded tape into NTSC for playing on TV systems in the US, Canada, Japan etc. TV Standards conversion from NTSC to PAL are more problematic due to the variety of tape formats. If you have tapes either originating in those countries, or recorded on cameras sold in those countries, or if your finished DVDs are destined for one of those countries, you will require TV Standards Conversion. The cost of conversion and transfer to DVD of PAL to NTSC is £40. The price applies to consumer tapes only. For prices of PAL-NTSC conversions of professional, please contact us. Discounts are available for quantities. 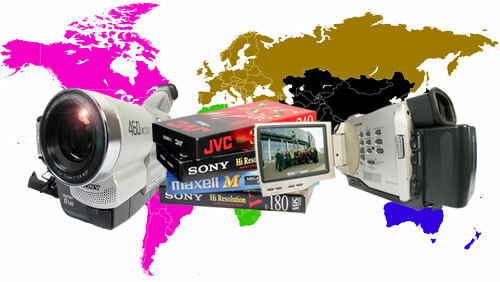 We can also convert NTSC VHS, VHS-C, S-VHS and Mini DV to editable AVI files. The cost of this is £40 per tape (up to three hours) with a discount for quantities. Although DVDs can last a lifetime without deterioration in quality, one scratch or scuff mark will render it unplayable.